October 7, 2018 October 7, 2018 Newsdesk 0 Comments AAPLU, Arunachal, National labour institute, V V Giri National Labour Institute. The Ten members team of AAPLU will participate in 5 days training at V V Giri National Labour Institute. 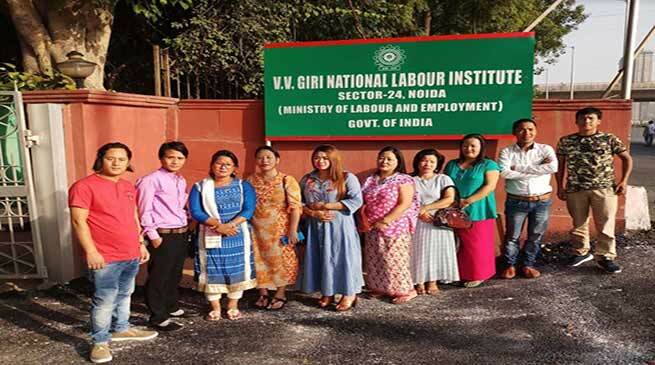 The Ten members team of All Arunachal Pradesh Labour Union (AAPLU) will participate in 5 days training at V V Giri National Labour Institute, department of Labour and Employment, Government of India, Sector-24 Noida, Utter Pradesh from October 8 to 12. Talking from Noida over phone, AAPLU President Dana Tadu informed that ‘ it is a great opportunity for the AAPLU’s members have been able to get training at national level training institute. we hope that such training enrich our members who will later guide fellow friend at state level”. The ten members team which include AAPLU Women Wing President Tagru Tami, Vice President Tame Sita, General Secretary Romik Yali, AAPLU General Secretary M R Oduk, IPR Secretary Ngurang Naga, Dy Spokes Person Sangio Tasar, Patey Kaha, Rikda Riba and Karpi Lombi who will get training on ‘strengthening awareness on labour issue’ gender, poverty and employment and other issue. CM Pema Khandu meets VP Venkaiah Naidu.